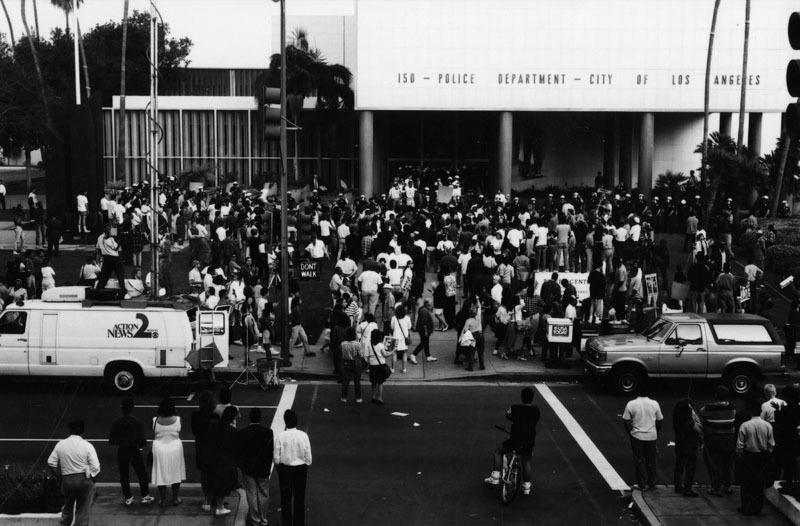 A group of people outside the LAPD's Parker Center on April 29, 1992. This month marks the 25th anniversary of the 1992 Los Angeles riots, which were sparked by the acquittal of four white LAPD officers in the beating of Rodney King. Of course, that’s not the beginning—or end—of the story. A feature length documentary by writer and director John Ridley (12 Years A Slave, American Crime) explores the decade that preceded the uprising. Let It Fall: Los Angeles 1982-1992 premieres in theaters on April 21 and on ABC on April 28. The two-hour documentary includes new interviews with eyewitnesses and tons of archival footage from ABC News. Ridley is also making a film with Imagine Entertainment about the L.A. riots, which is how the documentary came about, according to Deadline. “The goal is to give the space to get the real details from people, and get beyond the images that everyone is so familiar with,” Ridley told the L.A. Times back in December. It looks to be critical viewing for anyone who wants a better understanding of one of the most important chapters in L.A. history—and to see how its legacy continues to shape our city and nation today. Previous articleThe 7 Best Bread Baskets in L.A. The Duo Behind the Tonya Harding and Nancy Kerrigan Museum Are Bringing a Grey’s Anatomy Exhibit to L.A.